Laura is Chief of Staff for Supervisor Bill Gates. As Chief of Staff, Laura provides a visible link between elected officials and the public, acting as a representative of the Supervisor in dealings with constituents (both individually and in groups), County Departments, Boards and Commissions, and providing staff assistance to the Supervisor and Board. 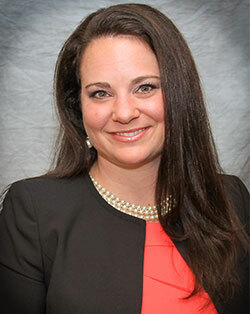 She serves as policy advisor and develops yearly strategic plans and priorities for the District. She also supervises the constituent service function, resolves complex cases, conducts research and report writing, and oversees office operations including supervising other positions in the office, and budget and calendar management. Laura was chief of staff for Councilman Bill Gates at the city of Phoenix. Laura is a Greater Phoenix Chamber of Commerce Valley Young Professionals Board Member. Laura is a graduate of Valley Leadership Class 32, a leadership development organization in the greater Phoenix metropolitan area. She remains actively involved in the organization as a Community Steward and served two years as a Leadership Institute Vice Chair. She previously chaired the Community Engagement Program Day, coordinating the joint program day with Hispanic Leadership Institute. She is a former 56th Fighter Wing Honorary Commander with Luke Air Force Base and a life member of the Fighter Country Partnership Blue Blazer Squadron – Bravo Class. Additionally, she is a member of the Urban Land Institute (ULI), and has served as Membership Chair for the Central Arizona Young Leaders Group, part of the ULI Main Membership Committee, on the ULI YLG Programming committee and on the Regional Visioning Committee. Laura holds an undergraduate degree in Political Science from Arizona State University. She received her Juris Doctor degree from the William S. Boyd School of Law at the University of Nevada Las Vegas and graduated with a Dean’s Award. She is licensed to practice law in both Arizona and California. Prior to working with Supervisor Gates, Laura was Senior Associate for a Phoenix-based public affairs and government relations firm where she provided representation for public and private sector clients within state, county, and local government and also worked at a Southern California law firm focused on advanced estate planning, estate taxation, and corporation formation for high net worth clients.